Dr. Seth Stephens is a Nurse Practitioner and the Director of Disease Management Services for a hospital system in Southeast Texas. His work presently centers on innovative and cost-effective ways to manage chronic illness. Dr. Stephens earned a Doctor of Nursing Practice degree from Texas Tech University Health Science Center. Coronary artery disease has been the leading cause of death in America for many years. With this disease, blockages develop in the arteries that supply blood to the heart. These blockages decrease blood flow to the heart muscle, which can eventually lead to a heart attack. Cardiac stents are devices used to treat these blockages. Stents are mesh tubes, usually made of metal, that are placed inside the arteries of the heart to reduce narrowing and strengthen the artery walls. As with all medical procedures, there are some important side effects to be aware of associated with cardiac stent placement. Chest pain is common after cardiac stent placement, reported by as many as 41 percent of people within the first 72 hours after the procedure, according to an April 1999 "Herz" research article. This pain can be caused by stretching or spasms of the artery walls where the stent was placed, or it could be a sign of a serious heart attack. After cardiac stents are placed, people usually are given a prescription for nitroglycerin tablets (Nitrostat) to take if chest pain occurs. It is important to report any chest pain that occurs after cardiac stent placement to the healthcare provider who performed the procedure. Palpitations -- the sensation of one’s heart racing or skipping a beat -- are common after cardiac stent placement. This may occur due to improved blood flow reinvigorating injured areas of the heart. Palpitations might also signal serious heart rhythm disturbances that could be the result of a heart attack. A study reported in January 2013 in "The Scientific World Journal" found that about 83 percent of people who underwent cardiac stent placement had some type of temporary heart rhythm abnormality within the first 48 hours after the procedure. The significance of palpitations can be easily determined by an electrocardiogram. Depending on the cause of the palpitations, additional treatment may be needed. Bleeding from the stent insertion site, from a tear in the artery where the stent was placed or from a puncture of the heart may occur after the procedure. If significant bleeding occurs, it is typically noted within the first 12 to 15 hours after stent placement. Signs of major bleeding include dizziness, light-headedness and fainting. Major bleeding at the site of stent insertion occurs in 0.15 to 6 percent of placements, according to February 2013 review published in "The Open Cardiovascular Medicine Journal." Although uncommon, major bleeding is an extremely serious problem that can be life-threatening if left untreated. After cardiac stent placement, the body mounts a complex response to the presence of the device. This response is sometimes exaggerated, causing a sudden blood clot and tissue accumulation that partially or completely blocks the stent. This complication, known as a stent occlusion, obstructs blood flow to the heart muscle, which often results in a heart attack. Although the risk continues for up to a year after stent placement, occlusion is most likely in the first 30 days, affecting from less than 10 to 32 percent of stents, according to 2011 guidelines published by the American College of Cardiology, the American Heart Association and the Society for Cardiovascular Angiography and Interventions. When stent occlusion occurs, immediate treatment is necessary. Emergency coronary artery bypass surgery might be needed to restore adequate blood flow to the heart. 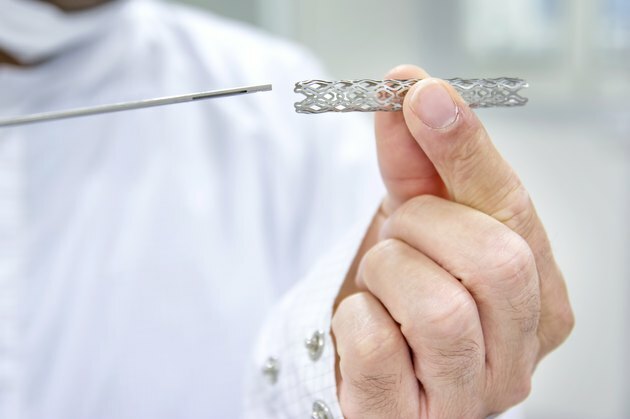 Cardiac stent placement is a serious, life-saving procedure. It is important to follow all instructions from the stent healthcare team to help ensure a successful outcome. Taking all prescribed medications -- especially blood-thinning medications like clopidogrel (Plavix) or prasugrel (Effient) -- helps reduce the likelihood of complications. Seek immediate medical care if you have a cardiac stent and experience any signs or symptoms of a heart attack, including: -- Chest pain not relieved by medications. -- Nausea with or without vomiting. -- Excessive sweating, pale skin color or dizziness. -- Shortness of breath. National Heart, Lung and Blood Institute: What Is a Stent? The Scientific World Journal: Arrhythmias Following Revascularization Procedures in the Course of Acute Myocardial Infarction: Are They Indicators of Reperfusion or Ongoing Ischemia?